The secret ingredient in this small-batch trifecta of delicious chocolates: nourishing, aromatic turmeric. We're guessing you already know and love chocolate. That's how you ended up here. But what if we told you we put a spicy, nourishing spin on your favorite indulgence? Hello, turmeric! These raw, vegan chocolate bars and hot cocoa mix are chock full of the vibrant orange spice. It's mild yet aromatic and has a wonderful claim to health fame: anti-inflammatory properties. But let's not forget about the other delectable ingredients to savor here. 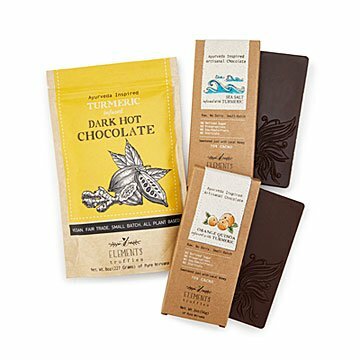 The chocolate bars come in two unique varieties: orange quinoa, and sea salt sweetened with raw honey. The dark chocolate cocoa is a delightful, not-too-sweet mix of cacao, coconut sugar, and Himalayan salt. We don't want to say it's "guilt-free" per se, because that might take away from its yum-factor. And the yum-factor is off-the-charts. Made in small batches in Kearny, New Jersey. The hotchocolate mix is thick and dark. Just like how I like to sip it.